Let's face it, no one likes picking up after his or her dog, but no one says it can't be done with a little style. Unroll one of the Poopy Pack bags from the others, tear it off using the perforation and take it with you when you take your dog outside. They are great for everyday use, or when you take your dog to the dog park or while traveling. 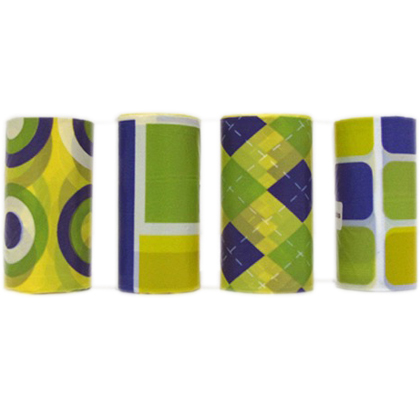 They come in handy rolls that you can keep in your car, purse or even in your pocket. Taking a roll with you is perfect if you plan on being outdoors with your pet all day. Rest assured, these Poopy Pack bags are 100% degradable so you won't have to worry about their effects on the environment. Not a toy. To avoid suffocation, do not let your dog play with bags. 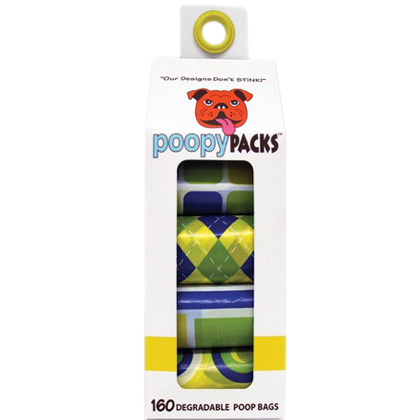 Poopy Packs are easy-to-use, 100% degradable dog waste bags. You can carry them with you in your pocket or purse or even store them in your car for when you are on the go. Once you open the box, take out one roll and tear off one bag at the perforation. Unwrap the bag, grab the bottom and turn it inside out so bag is completely covering the hand that will pick up the waste. Pick up your dog's waste with the Poopy Pack bag, then and slowly and carefully pull the bag back over the hand with the waste inside and throw away the bag. If you plan on being out with your dog for a long period of time, keep a whole roll in your pocket, purse or inside a bag holder (fits most standard bag holders). This technique will properly contain your dog's waste and keep your hands clean. Even though using the above technique will keep your hands clean, it is always recommended to wash your hands every time you come in contact with pet waste.